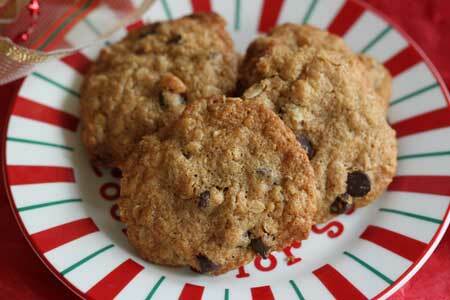 This is a relatively nutritious cookie made with peanut butter, oats and nuts. Preheat oven to 375 and have ready a couple of ungreased baking sheets. With a mixing spoon, beat together oil & peanut butter. Add sugars, baking powder, baking soda, salt & cinnamon. Beat in eggs & vanilla. Stir in flour; then stir in oats, cranberries and nuts. Drop by rounded teaspoonfuls' or level tablespoons onto the ungreased baking sheets and bake at 375 for 8-10 minutes or until lightly browned. I haven't baked all my dough yet, but the yield is probably around 36 cookies. If you use a natural peanut butter or one that's slightly runny, you may need to chill the dough just enough so that it holds its shape when scooped.